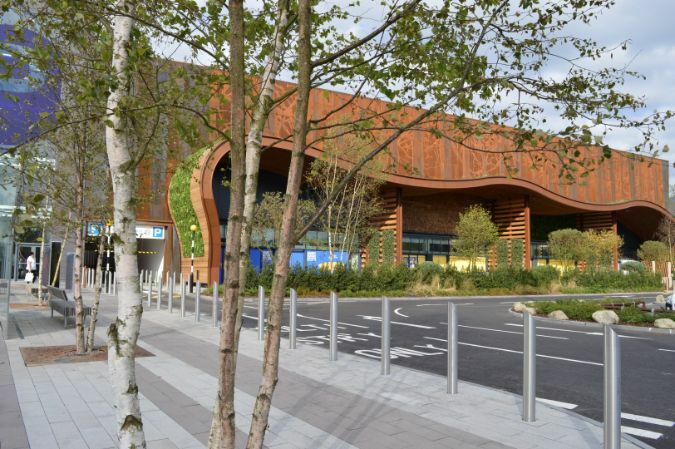 Glasgow Fort Retail Park is one of Scotland’s largest and most popular ‘out of town’ shopping destinations with 100 outlets and parking for 2,500 vehicles. It has a catchment area covering in the region of 2 million people and circa 100 retail and leisure outlets covering over 800,000sq ft.
Owners, British Land are one of Europe's largest publicly listed real estate companies. Their strategy is to create Places People Prefer. Working with Landscape Architect, Macgregor Smith, the landscape strategy was to create an environment that encourages people to dwell in the external spaces. 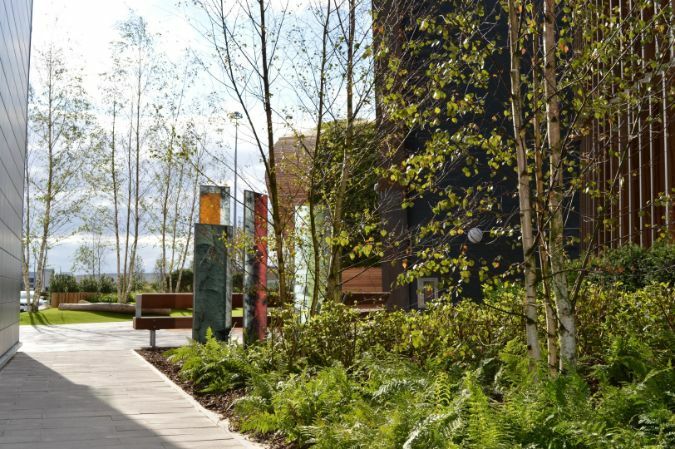 The landscape upgrade project was to include tree planting within the site that echoes the surrounding Scottish woodlands with 12m tall semi-mature Birch trees and native Pines. Landscaped borders surrounding the park were also included in the scheme. 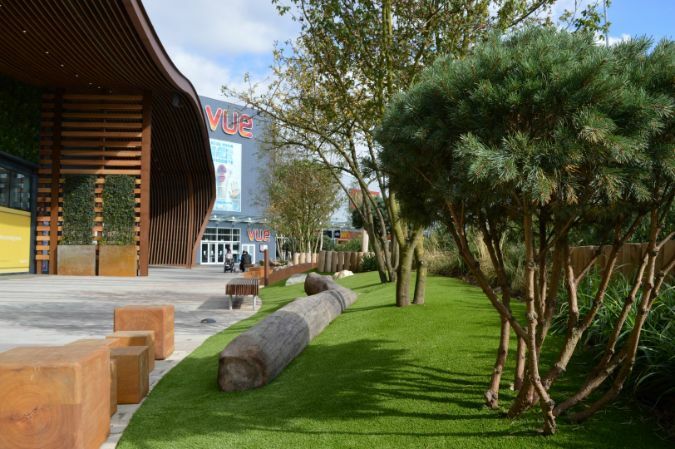 Award-winning commercial landscaper Grace Landscapes were awarded the landscaping contract and turned to Green-tech to supply everything required for the successful planting and development of the trees, shrubs and overall planting scheme. This included sixty Rootball Fixing System's, the preferred method of securing rootballed, containerised and airpot-grown semi-mature trees. The ease of installation and lack of unsightly guy wires makes this system the first choice for customers wanting a first class solution. The Rootball Fixing System's are tailored to suit the rootball dimensions and enables secure positioning of newly transplanted trees. Green-tech also supplied the irrigation system for each tree, the Mona Relief with Aria Inlet, which delivers water directly to the tree or shrub roots at a consistent level to aid growth and development. Where the trees were installed into a hard landscaped area, such as pavements or the car park we supplied Mona Relief Piazza, a square cast aluminum unit which is designed for installation specifically into this type of area. It p provides a clean and contemporary look. 1000 plus tonnes of Green-tree top soil, Green-tree Intensive Roof Garden Substrate and Green-tree Amenity tree soil was supplied and used for the planting of the trees and throughout the entire landscaping scheme. Shrubs in the borders surrounding the shopping complex were top dressed with the 210m3 of bark mulch that was also supplied. The landscaping for this high-profile development has been well received and Grace Landscapes has recently commenced Phase 3 of this project.